Hi guys! I was recently invited by Omy.sg to attend a food trail event! Pretty exciting eh!? I simply love food and they have definitely chose the right person to attend this event. I'm going to separate this food trail into several blogposts probably maximum 3 blogposts because I don't wanna mix up everything together in a single blogpost. If you guys did not know "Bugis+" was formally known as "Illuma". I was amazed by the number of food outlets Bugis+ offers and there are plenty of food choices you can't even make up your mind what do you want to eat. Let's start with the first shop I'm going to introduce you guys and it's ONE OF MY FAVOURITE! 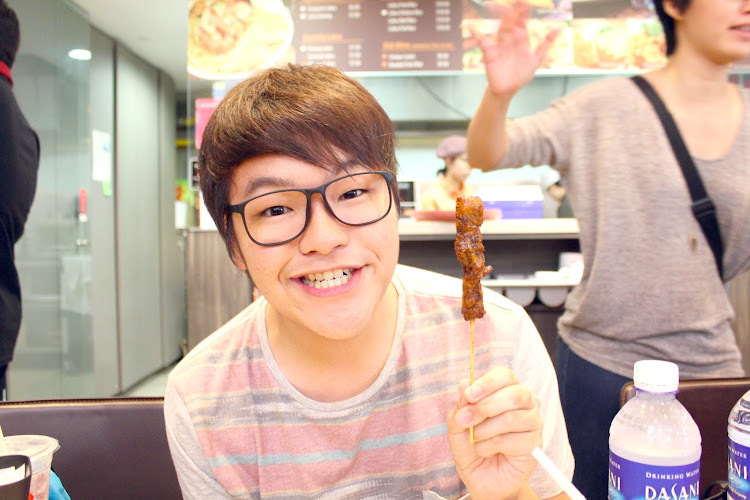 If you guys did not know, I AM IN LOVE WITH TAIWANESE FOOD. Hahah my obession with Taiwan is still not over yet. You can take a look at the menu, these are the list of Taiwanese dishes/snacks you can choose from! Yummmms at the crispy chicken! Can't wait to try it! 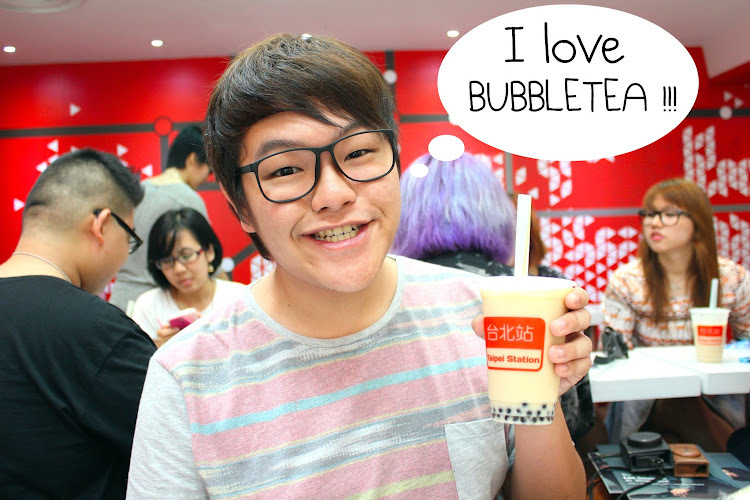 How i express my love for milk tea! You guys should try it too! This has got to be my favourite flavour among all because is CHEESE! I feel that it was a bit salty. The fried chicken was tender and juicy, every bite just makes you wanna have more. It is truly the best among the other 2 flavours (I'm biased to cheese) but it's personal preferences depends if you like cheese or not. I rate this 9.5/10! Super nicely cut straight sweet potato fries. You can feel the thickness of the sweet potato when you bite onto it. Very good replacement if you don't feel like eating fries. It's definitely a more healthier option :) I rate this 8/10. Another healthier choice is their broccoli. Looks may not be that appealing but when you put into your mouth, it brings out the long-lasting taste! Though how I dislike vegetables a lot, I REALLY LOVE LOVE HOW THEY CAN MAKE THIS GREENISH ITEM INTO A SUPER NICE DISH. It's not that oily and perfectly fried. I rate this 9/10. How can you not miss out Luo Rou Fan?! Hahaha it is one of the most popular dishes in Taiwan. This is not any ordinary meat rice dish. Originally from Taiwan. Taipei Station's Braised Pork with rice is a MUST-EAT. With it's fragrant rice topped with succulent and tender pieces of pork, this dish is sure to make your mouth watered, Add on a piece of braised egg, and some vegetables and voila, you have a simple yet tasty meal to enjoy! Taiwan is also famous for their mee sua! The noodles was smoothly and covered fully with the sauce. That time I was in Taipei, I queued so long to get this! But at Singapore, you can get it at Taipei Station at Bugis+! What are you waiting for? This is a must try! I rate this a 10/10 !! A full view of what I had at Taipei Station. I was already half-fulled! Alright! Let's move on to the second place I want to share with you guys! If you love Laksa this is the right place for you! Serves all types of laksa in Asia! Btw, I love the name of this restaurant! It's so unique cos of the "nia" added behind the laksa which is guess it means "only" in Hokkien. Menu of Laksania, you can check it out! Just looking by their bulletin board filled with so many " I love Laksa " drawings and card makes you wanna try it now! They have appeared on the newspapers too! Loving the bright and vibrant colour of this laksa. Kelantan Laksa consist of fish and yellow ginger that produces a strong fragrant smell. The amount of fish inside this dish was a lot. It takes many hours to de-bone the fish added into this bowl of laksa. It has thick rice noodles, cucumber stripes. It is not spicy at all so it's suitable for kids to have this. If you really wanna eat it spicy you can add their special sambal chili to spice it up! Overall I like this dish a lot! I rate this 8.6/10. Nothing beats the original taste of Singapore Laksa. It brings out the taste of dried shrimps, shallots and spices cooked with coconut milk unlike other laskas you can find outside. The spiciness level is around 4/5 so you might want to add sambal chili into it! The thick soup of this laska is packed with full of it's flavour brings back the Singapore taste.Yes! You should definitely try this! I rate this 8/10. Average satay served with curry sauce. I was wondering why was the satay sauce creamy white. Haaha maybe it's their secret receipie. Served with freshly cut onions. The chicken was moist and tender. I rate this 7/10. Great side dish add while having your laksa. This laska is served with vermicelli, shredded chicken and topped with pieces of celery. To me, it has a strong taste of herb smell, so I don't think it is one of my favourite but I had other blogger friends that said this laska tasted really good. It is spicy and you can taste the flavour of prawn and chicken broth. I guess it is based on the individual itself to decide if it's nice or not. I'm rating this 6/10. Laksania does not only sell laksa only but they do sell others too! They sell western food such as pastas and burgers. 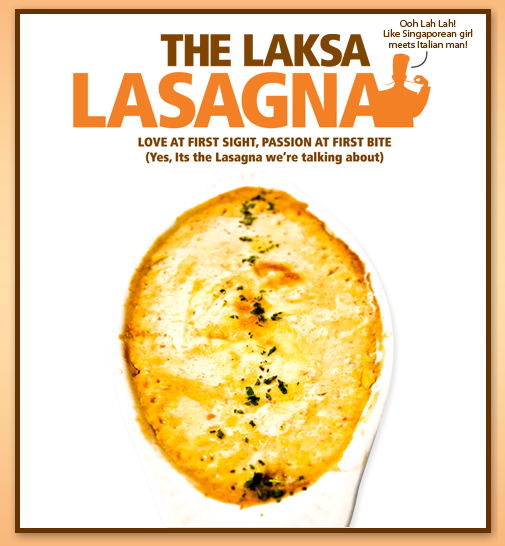 One of them that caught my attention was the "Laska Lasagna", you can check out the picture below I found on their website. I'll be looking forward for my next visit there. Can't wait to try it! I shall conclude my blogpost here! Look out for Part 2 that will be coming up really soon! See ya!